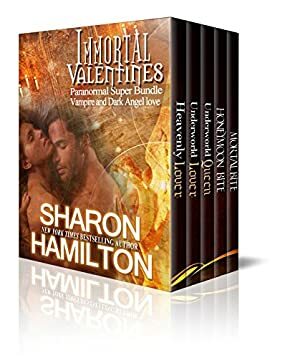 Five full length books by Sharon Hamilton: Heavenly Lover, Underworld Lover, Underworld Queen, Honeymoon Bite and Mortal Bite. These books are the entire works of Sharon's Paranormal series, her Golden Vampires of Tuscany and her Guardians. Over 1000 pages of dark angel/vampire love waiting for you. Log In to track Sharon Hamilton on eReaderIQ. to be notified each time the price drops on any book by Sharon Hamilton. to stop tracking Sharon Hamilton. We started tracking this book on February 18, 2015. The price of this book has changed 22 times in the past 1,523 days. The current price of this book is $7.99 last checked 20 hours ago. The lowest price to date was FREE last reached on July 3, 2016. The highest price to date was $9.99 last reached on May 4, 2017. We last verified the price of this book about 20 hours ago. At that time, the price was $7.99. This price is subject to change. The price displayed on the Amazon.com website at the time of purchase is the price you will pay for this book. Please confirm the price before making any purchases.